Is HealthyWage for real? Where can I find a HealthyWage review? In addition to the sheer size of the HealthyWage press page and the credibility of the press outlets (e.g., Wall Street Journal, Consumer Reports, Good Morning America, etc. ), pay close attention to the articles themselves and watch some of the videos: you will hear HealthyWage reviews directly from HealthyWage participants and corporate clients (you do not need to participate through a company — you can participate on your own) who give glowing reviews of HealthyWage. Ben Carnes (a schoolteacher and football coach in Westfield, IN) told NPR in this recent article all about his HealthyWage bet and weight loss. Ben won about $1,500 for losing over 100 pounds. Barbara W. (a retired Vanderbilt nurse) told The Tennessean (one of Tennessee's principal newspapers) in a recent article: "the old saying 'If it sounds too good to be true it probably is' does NOT apply in this case . . . One of the best investments you can make is an investment in your health." (Barbara made $669 for losing 30 pounds). Jennifer D. had her HealthyWage weight loss success story shared by Good Housekeeping in a recent article. Jennifer won $4,800 for losing 102 pounds. Frank Norman shows off the check with his winnings after a successful HealthyWager challenge. Watch his full interview from Raleigh's ABC11. Tessa Tribbett shared how she leveraged HealthyWage to help her lose weight and improve her overall health in a recent article with Go San Angelo, part of the USA Today Network. Tessa won over $5,610 for losing 87 pounds. There are many, many more examples -- check out the HealthyWage press page for more. For most people, the need for proof that HealthyWage is legit ends here. HealthyWage maintains an A+ rating with the BBB. Check out our company profile here. HealthyWage has hundreds of large corporate clients who have offered our programs to employees for years. Note: You do not have to participate through your company — you can participate on your own. As proof that we have had these clients and that they — and their employees — have liked HealthyWage, here are some third-party-published testimonials. This Employee Benefits News article describes how Domino's has commissioned HealthyWage multiple times to offer nationwide HealthyWage challenges (EBN is a major trade publication). The article features a Domino's executive giving a positive review about HealthyWage. As another example, check out this Washington Post article following the HealthyWage experience of employees at Meritus Health, a major DC-area health system and HealthyWage client. There are literally hundreds of other examples of participants and corporate clients describing their experience with HealthyWage. Check out our press page. You do not have to participate through your company — you can participate on your own. HealthyWage participants love to document their weight loss journeys on their independent YouTube channels. Here are just a few of our favorites. - A Merry Life, On A Budget excitedly shares that she has started a HealthyWager challenge in this video. - Beauty From Ashes provides a daily video log of her HealthyWage journey on her YouTube channel. - In this video, Bev from DysFUNctional Family Values documents her entire weight loss journey from her first weigh-in to receiving her check. - Someday I'll Sleep Autism Vlogs shares a detailed review of her HealthyWage experience after receiving her winning check. Check out her video here. - Coach Roden uses this video to announce the start of his HealthyWager personal weight loss challenge. - The Penny Hoarder spotlights HealthyWage winner Christina Castro who lost 84 pounds and won $1,191. View the full video here. Scores of people have reviewed HealthyWage in the App Store and Google Play Store -- and the results reveal that HealthyWage is popular and highly-rated. Check out the ratings and reviews for yourself: Google Play Store and Apple App Store. Check out these episodes of our Facebook Live broadcast "Winner Wednesday" to hear first-hand accounts from some of our winners. Our winning participants LOVE sharing their success on social media! cj.rose got paid $1,630.31 for losing 50 pounds and proudly shared a photo with her winning check. View her post on Instagram here. Karen O. posed with her HealthyWage check to show off her successful 40 pound weight loss. Check out her post on Facebook here. Justine S. shares her before and after photos to celebrate her HealthyWager win and profit of $2558. Check out her post on Facebook here. Kelley's on her way to Mexico thanks to her winnings from HealthyWage! Check out her post on Facebook here. Kimberly hit her HealthyWage goal and shared with her friends and family. Check out her post on Facebook here. wanderingflask charts her HealthyWager progress. When you put in the work, you'll want to show it off! Check out her post on Instagram here. sarah.zamora.37 shares an incredible before-and-during photo duo that shows off her amazing progress during her HealthyWager. Check out her post on Instagram here. hr_krista celebrates her HealthyWager win by sharing a screenshot of her winner email AND an after photo. Check out her Instagram post here. Alexander C. dedicates his HealthyWager victory (losing 70 pounds in 7 months and winning almost $2,000) to his mom. Check out his Facebook post here. David S. shares an incredible before and after photo upon reaching his HealthyWage goal weight. Check out his Facebook post here. Chris B. found the motivation he needed with needed with HealthyWage. Check out the before and after pics in his Facebook post here. Delia's got it right - "If you can't bet on yourself, you can't expect anyone else to!" Check out her celebratory Facebook post here. Rachel's excitement over winning her HealthyWager is contagious! Check out the before and after photos in her Facebook post here. Stephanie S. met her goal, won her bet, and got paid...and she's got a photo of her check to prove it! Check out her Facebook post here. Fifth Wheel Physical Therapist celebrates 45 pounds lost and over $2,200 gained in 8 months! Check out his Facebook post here. pippki's before and after photos commemorate a job well done during her HealthyWager challenge. Check out her Instagram post here. Dans_changeup lost an incredible 150 pounds and shares the news of his HealthyWage win. Check out his Instagram post here. Transformation_vibes shares some progress pics during her HealthyWager journey. Check out her Instagram post here. Evelyn L. shows off her amazing before and after photos while calling HealthyWage the "best thing since carbs." Check out her Facebook post here. Tamara K. rejoices over losing 40 pounds and winning almost $1,000. View her Facebook post here. Jarrett F. celebrates the motivation he found with his HealthyWager challenge. View his Facebook post here. Amy L.’s check from HealthyWage cleared! View her Facebook post here. Sarra W. hit her goal and shared her HealthyWage announcement. View her Instagram post here. Mangojuice2.0 shows off her incredible HealthyWage journey. View her before and after post on Instagram here. Rachel N.’s amazing transformation from her HealthyWager challenge is the focus of her Facebook post here. Rachygirl1982 shares her phenomenal progress, and HealthyWage winnings, in her Instagram post here. Journey_of_matt lost an impressive 62 pounds during his HealthyWager challenge and shows off his before and after shots on Instagram here. From the start of her HealthyWager to beyond her successful end, Christine shares her experiences. View the conversation on Facebook here. Nancy lost 45.2 pounds and can't wait to go shopping with her winnings. View her post on Facebook here. Valerie excitedly announces that's she won her HealthyWager. View her post on Facebook here. Meg B. won $780.59 from her HealthyWager and shares a snap of her PapPal depost. View her post on Instagram here. catsketo shares her excitement over restarting her HealthyWager. View her post on Instagram here. valmcpak shows off her amazing results that led to her winning $1,695. View her post on Instagram here. Hannah won $89 for losing 6% in a Jackpot Challenge. View her post on Instagram here. Cort won $1,400 for losing 65 pounds in 6 months. View his post on Instagram here. Bree won $1,160 for losing 35 pounds in 6 months. View her post on Facebook here. A team from Cone Health won $2,500 in a Team Challenge. View their post on Facebook here. A team from the City of Ft. Myers won $7,500 in a Team Challenge. View their Facebook post here. Rachel won back her challenge entry fee by maintaining her weight loss. View her post on Instagram here. AJ won $89.05 for losing 6% in a Jackpot Challenge. View her post on Instagram here. Mike won $1,014 for losing 52 pounds in 6 months. View his post on Instagram here. Lorissa tracks her HealthyWager journey with progress pics. View one of her posts on Instagram here. Bertha won over $1900 for winning her HealthyWager challenge. View her post on Facebook here. Robin proudly shares her success for losing 25 pounds in 6 months. View her post on Facebook here. Shannon celebrates a Non-Scale Victory during her HealthyWager. View her post on Instagram here. fitgirl_baileybride shows off her amazing HealthyWager Before & Afters. View her post on Instagram here. Steph celebrates her progress throughout her HealthyWage journey. View her post on Instagram here. diaryofarecoveringfoodaholic shares her HealthyWager progress Before & Afters. View her post on Instagram here. Tom lost an incredible 147 pounds; HealthyWage was one of his tools for success. View his post on Facebook here. Barbara celebrates her major HealthyWager winnings of $4349.78! View her post on Facebook here. Amandie Fults hit her HealthyWager goal and celebrated. View her post on Facebook here. Mary Eileen was so excited to win her HealthyWager prize of $2,051.71! View her post on Facebook here. 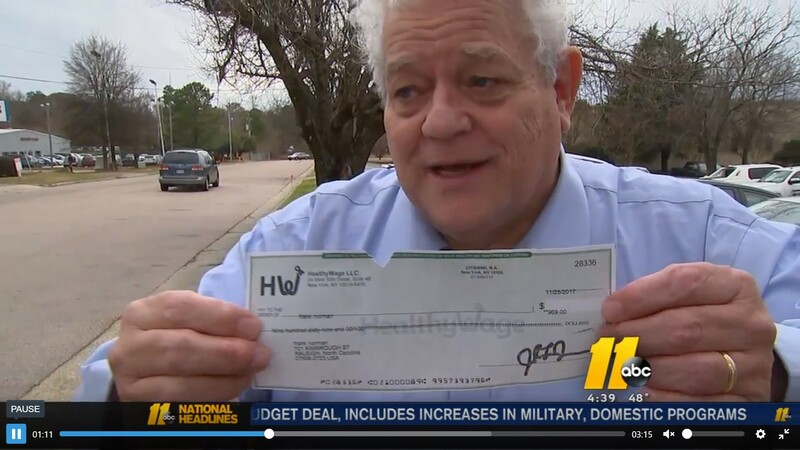 virgeofcerberus shows off his $2,137.67 winning check from HealthyWage. View his post on Instagram here. loladay shares her incredible transformation before-and-after her HealthyWager. View her post Instagram here. There's a ton more where those came from! Just click on one of the links below to see for yourself. View participants' public posts about HealthyWage on Facebook. View participants' public posts about HealthyWage on Instagram.